The city of Heraklion is the biggest city in Crete and the fourth biggest city by population in Greece. Located in the north coast of the island overlooking the Cretan sea, it is physically protected by the old Venetian fortification walls, the most important standing monument of that era, insinuating the city’s adventurous past. The island of Crete and Europe have strong historical ties since ancient times. In Crete, according to Greek mythology, Zeus, the father of the Gods, brought the beautiful young virgin girl named Europe with whom he was in love with. Their romantic relationship produced a son, Minos, whose name was later given as a title to all Cretan Kings and the ancient civilization of Crete. 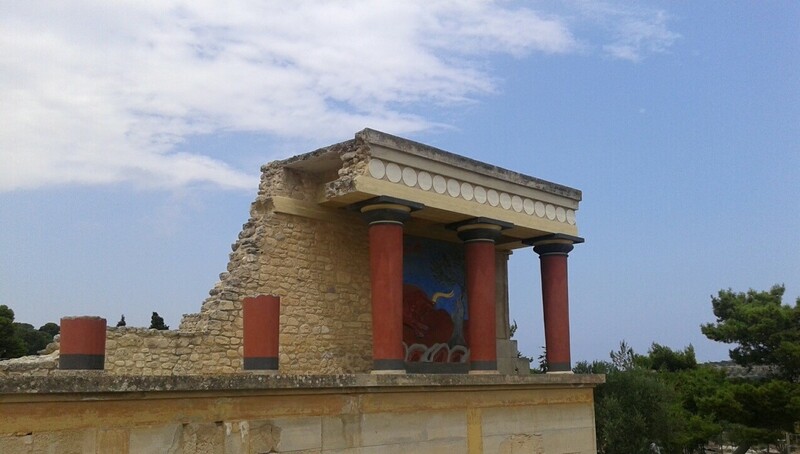 During Minoan times, Heraklion was probably the port of Knossos, the cradle of the Minoan civilization (2000 – 1450 BC). There are references of the ancient city of Heraklion from historians, such as Strabo, who mentions in his writings Heraklion as the port of Knossos, named in honor of Hercules, who went to Crete to kill the wild bull and complete the 7th of his 12 labours. In 9th century AD, Arabs conquered Crete and established a new city in the place of Heraklion and named it Rabdh al Khandak (Chandax Castle). The named Chandax is still used by many of the city’s residents. Byzantines regained control of the island at around 1000 AD and managed to retain its control until the 13th century. During the 14th century, the city fell in the hand of the Venetians. The Venetian era lasted four and a half centuries and it was a period of great advance and growth for the city in areas like commerce, architecture, literature and art in general. The world renowned painter Doménikos Theotokópoulos (El Greco) was born and raised in Heraklion of that period. 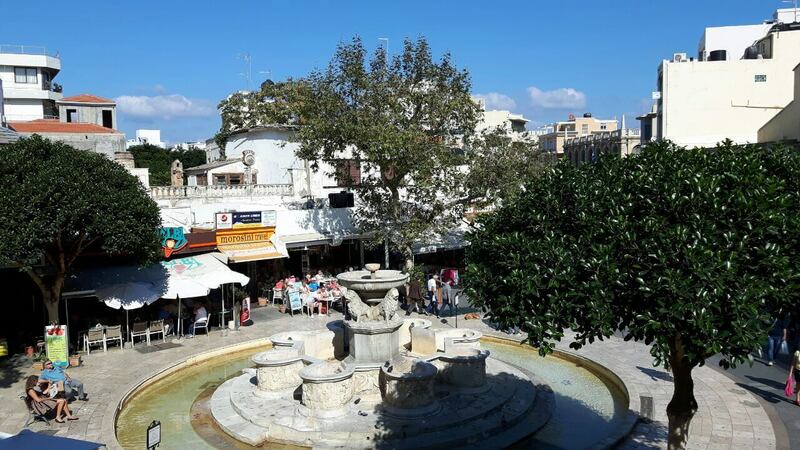 Many Venetian monuments still stand in Heraklion, like the fortification walls surrounding the old part of the city, the castle in the old port (Koules), the Venetian loggia, the Morosini fountain and others. After the siege of Heraklion from the Turks (started at 1648 and lasted for 25 years), the Venetians where forced to surrender the city. Cretans revolted against the Ottoman Turks many times, in 1770, 1821, 1866 and 1895. At 1898 the island of Crete regained its autonomy and liberation from the Ottoman empire and at 1912 joined the rest of Greece. Every visitor that comes to the city already knows about the Palace of Knossos and the museum of Heraklion. In fact, the archaeological museum of Heraklion contains exhibits from the Neolithic period (5000 BC) to Roman ruins (4th century AD) and it is considered as one of the best in the world of its kind. In Heraklion, there is also a Historical and Folklore museum hosting exhibits from the post-Roman era of Crete, the Byzantine, Venetian and Turkish periods of the island and also from the 20th century. On the outskirts of town (5 km from the city center), lay the reconstructed ruins of the renowned Palace of Knossos. Literature lovers will also be interested to learn that it was here that that the famous writer Nikos Kazantzakis, one of the greatest writers of the 20th century, was born, raised and lived here for many years of his life. He was buried in a small fort on the top of a hill, very near to the center of Heraklion. There is also a museum dedicated to his life and his works, in the village Myrtia, 15 km south of Heraklion. 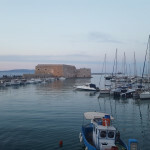 Modern day Heraklion is a lively city, with the third biggest port in Greece and one if the biggest in the Mediterranean. It is connected through seaways with Piraeus, Thessaloniki, Aegean islands, Cyprus and Egypt. 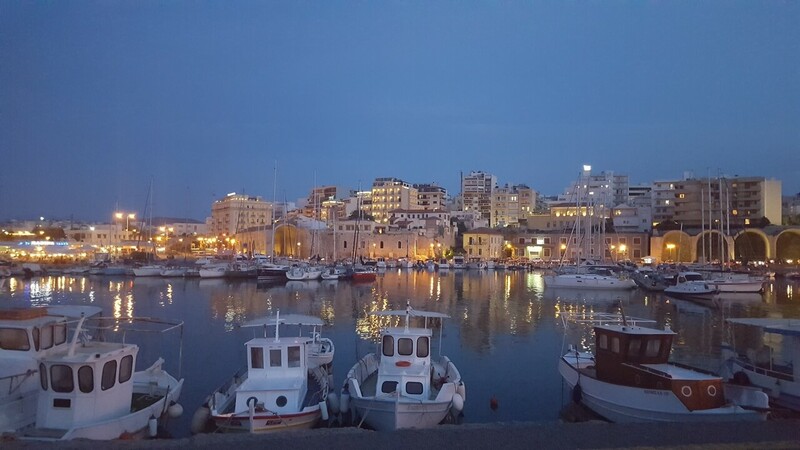 There are also frequent flights from Heraklion to other Greek cities throughout the year and direct flights to the EU and the Scandinavian countries for the biggest part of the year. 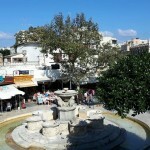 A variety of local, European and international cultural events takes place in Crete every year. 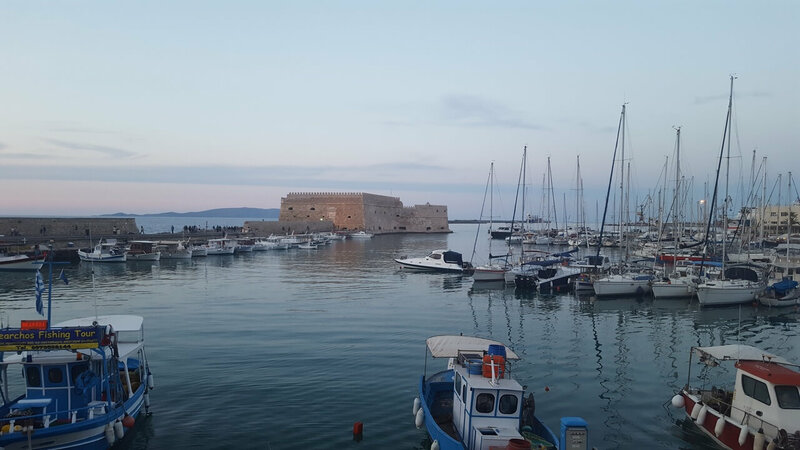 Art galleries, theater and literary projects, international conferences and scientific gatherings leave their mark on the everyday life of Heraklion. The Geopolitical location of Crete, at the crossroads of East and West, in combination with the Mediterranean climate have made the island and its capital city one of the most touristic places in Greece.